Recent excavations by archaeologists from Amgueddfa Cymru – National Museum Wales at the Viking age settlement of Llanbedrgoch on the east side of Anglesey, have shed important new light on the impact of Anglo-Saxon and Viking-age worlds operating around the Irish Sea. The new discovery of a skeleton in a shallow grave and the unusual (during this period in Wales) non-Christian orientation of the body, and its treatment, point to distinctions being made in the burial practices for Christians and other communities during the tenth century. The burial is an unexpected addition to a group of five (two adolescents, two adult males and one woman) discovered in 1998-99. Originally thought to be victims of Viking raiding, which began in the 850s, this interpretation is now being revised. Stable isotope analysis by Dr Katie Hemer of Sheffield University indicates that the males were not local to Anglesey, but may have spent their early years (at least up to the age of seven) in North West Scotland or Scandinavia. The new burial will provide important additional evidence to shed light on the context of their unceremonious burial in shallow graves outside the elite fortified settlement in the later tenth century. The new excavations this year have also produced seventh-century silver and bronze sword/scabbard fittings, suggesting the presence of a warrior elite and the recycling of military equipment during the period of rivalry and campaigning between the kingdoms. According to Bede, the borderlands between the Welsh and English were between AD610 and the 650s a target for Northumbrian intervention. The Northumbrian king Edwin subjugated Anglesey and Man, until Cadwallon in alliance with Penda of Mercia invaded England and killed Edwin in AD 633, to rule north-east Wales and Northumbria for a year. 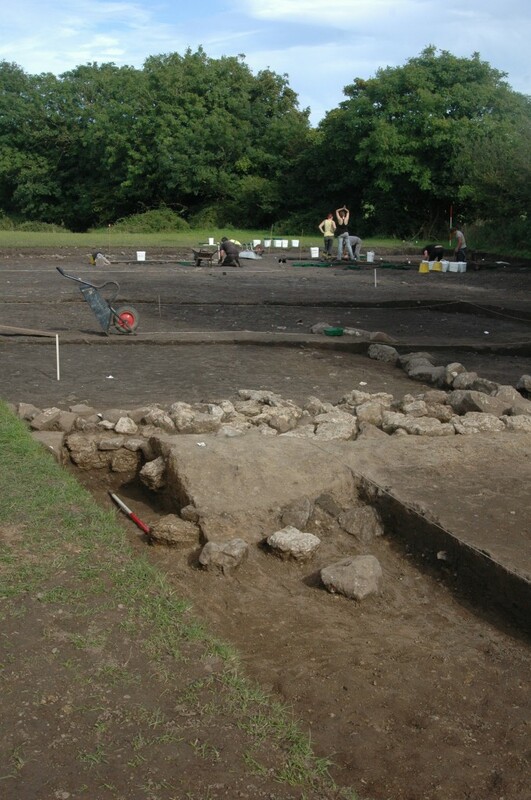 One of the most intriguing settlement complexes belonging to this period, the Llanbedrgoch site has been the subject of ten summer seaons of fieldwork by Amgueddfa Cymru’s Department of Archaeology & Numismatics. The results have changed our perception of Wales in the Viking period. The site was discovered in 1994 after a number of metal detector finds had been brought to the Museum for identification. These included an Anglo-Saxon penny of Cynethryth (struck AD 787-792), a penny of Wulfred of Canterbury (struck about AD 810), 9th-century Carolingian deniers of Louis the Pious and Charles the Bald, and three lead weights of Viking type. Past excavations by the Department of Archaeology & Numismatics between 1994 and 2001 revealed much about the development of this important trading centre during the late ninth and tenth centuries, but the development of the site during the preceding period had remained less clear.